The famed West Third Street bakery, marketplace, cafe and so much more officially has the keys to the new Studio City location, which according to this news, is a former post office on Ventura Place. That couldn't be a more perfect locale, considering the Studio City farmers market is on the same street. Owner Joan McNamara is one meticulous woman, so plans have probably been laid out since we heard about this second location early last year, but there's still construction to deal with and it's underway. While the space will be slightly different. The same menu, hundreds of salads, chicken Milanese, cupcakes, cheeses, lobster rolls, coffees, breads and gourmet goods throughout the space. 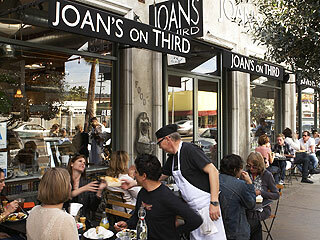 The new Joan's will open some time this year. We'll keep you updated!